Hirsch has been working professionally with websites since 2001, working exclusively in, and focusing on, the Jewish community. His goal is to take modern website design trends and apply them in order to build synagogue websites that provide a welcoming face to a synagogue community while allowing synagogue members to easily find the information they are looking for or complete common tasks of synagogue life. 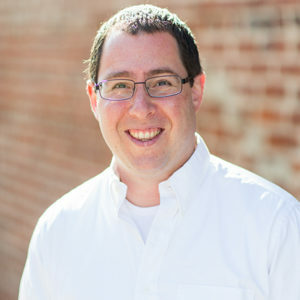 Hirsch offers a wide range of website knowledge to his synagogue web design clients from his years of experience working in the Jewish community. He takes pride in the work he does for each synagogue client and values his relationship with each synagogue design client. Hirsch lives in Raleigh, North Carolina, with his wife and two sons, and is a member of Beth Meyer Synagogue in Raleigh. Jen joined Addicott Web in 2018, bringing 5+ years of experience in helping synagogues and Jewish non-profits bring their communities to life online. She specializes in understanding client challenges and proposing effective digital solutions. With a can-do and positive attitude, Jen’s focus is on helping Addicott Web’s synagogue web design clients build a better online experience for their members and supporters. Jen plays an integral role in developing all outbound client communication for Addicott Web, focusing on sales, marketing, social media, customer outreach, online advertising, and more. Jen lives in Westchester County, New York, with her husband and two daughters. Contact us and we’ll schedule a time to talk to you about what your synagogue’s specific needs are, and see if it would be a good match working with us.